"Pairtial or tot remuival o the freemit female genitalia or ither injury tae the female genital organs for non-medical raisons" (WHO, UNICEF and UNFPA, 1997). Female genital mittlin (FGM), an aa kent as female genital cuttin an female circumcision, is the reetual cuttin or remuival o some or aw o the freemit female genitalia. ↑ 3.0 3.1 3.2 UNICEF 2016. Cappa, Claudia, et al. Female Genital Mutilation/Cutting: A Statistical Overview and Exploration of the Dynamics of Change, New York: United Nations Children's Fund, Julie 2013. 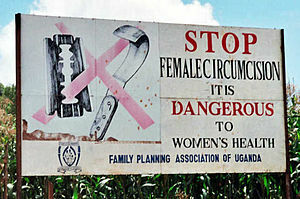 Female Genital Mutilation/Cutting: A Global Concern, New York: United Nations Children's Fund, Februar 2016. This page wis last eeditit on 6 August 2017, at 05:32.